There’s always hell to pay when JR manipulates a beautiful woman for his own gain. June 27 – Blackmail is the name of the game in tonight’s episode as JR and John Ross put into action their plans to outmaneuver their blackmailer Mitch Lobell. As usual, the Ewing father-son act’s plans require the services of a beautiful woman to lure Lobell’s unfortunate drug addict son into committing a third felony. John Ross is up at bat first, using the discovery that Rebecca was the source of the email that broke up Christopher and Elena to force Rebecca to set up Lobell Jr. Rebecca is at John Ross’s mercy and attends a support group meeting run by Lobell’s son. Getting him alone in a parked car, she passes herself off as a desperate junkie on the edge of relapse and tries to lure him into providing the drugs. To her surprise and eventual relief, he turns out be truly recovered because he’s found love. When Tommy confronts Rebecca about not putting the USB device in Chris’s computer, she tells him she has everything under control despite knowing that their plan can unravel at any given moment. At least we learn that money is one of the goals if not the main objective of their mission in Dallas. While Rebecca frets over John Ross’s eventual retaliation, Christopher is fighting his powerful attraction to Elena as she continues helping him with his methane project. Bobby notices the tension when Rebecca shows up during one of John Ross and Elena’s cozy moments and asks his son to confide in him, sharing that Ann was once threatened by the memory of Pam. While father and son help a cow with a complicated birthing, Christopher shares the story of the mysterious email that broke up his planned elopement with Elena. Seeing that his son his genuinely torn between two loves, Bobby counsels Christopher to get over Elena at all costs if he truly loves Rebecca. What’s really shocking is how Bobby doesn’t comment on the similar scenario he experienced decades ago with the letter Katherine Wentworth faked to break up his marriage to Pam. Has Bobby’s memory gone to pot? Also, he was involved in one of Dallas’s greatest love triangles with his beloved Pam and his original sweetheart Jenna Wade. Surely he could have given his son more nuanced advice! Although the cow doesn’t survive giving birth, its calf is saved and turned over to another cow to raise. Looking on, a proud Bobby and Christopher are reminded of their special bond through adoption. When John Ross’s plan to snag Lobell’s son falls through, JR takes his turn and uses his unsuspecting son in his scheme for good measure. Elena turns to John Ross for help in convincing a woman named Mrs. Henderson to allow Elena to survey some land staked out for her drilling project. John Ross charms the old woman — and Elena — in a bid to get back into Elena’s good graces. Elena prefers to take things slowly. Unfortunately for John Ross, a private eye hired by JR to tail him gets juicy pictures of the two frolicking with a water hose. JR plans to use the photos to instigate trouble for his son with Marta, who turns out to be a dangerously jealous woman with a rap sheet by the name of Veronica Martinez. Does Sue Ellen still have eyes for old JR after all these years? John Ross arrives late to a rendezvous with Miss Marta, which puts her on edge enough to take him out for a late night shopping trip to buy an expensive watch to help him keep better time. Although bothered, Marta agrees to finish the job Rebecca messed up and proves yet again that she’s a gal that gets things done. Handing the incriminating photos of a drugged out Lobell Jr. to JR after he shares the ones of John Ross with Elena, a pill-popping Marta appears to be reaching the end of her rope with her Ewing beau. JR cuts a new deal with her behind John Ross’s back but may have unknowingly put a loaded gun to his son’s head by setting off the sizzling senorita. 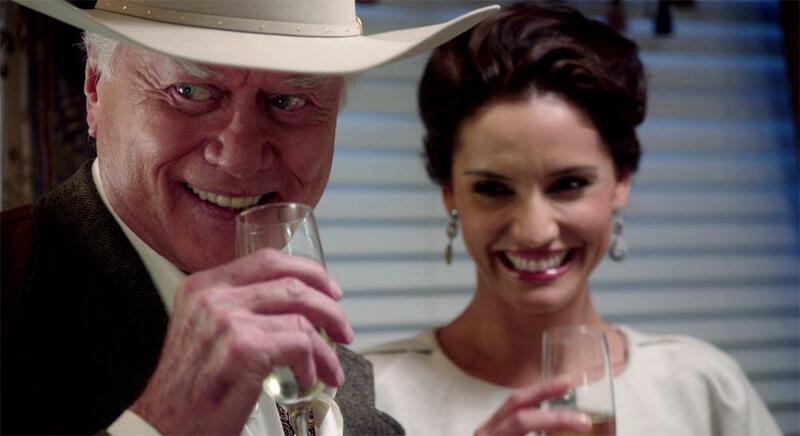 JR’s next stop is Lobell Sr.’s office to share his newfound leverage and dictate new terms for the sale of Southfork giving him 100 percent of the ranch, cutting out his son completely, for now anyway. While JR is his usual ruthless self, he’s showing a soft side where the still-beautiful Sue Ellen is concerned and shows up at her office with a gift, hoping to reignite that old magic. Instead, he’s treated to the sight of Cliff Barnes taking her out to lunch to discuss his possible backing of her gubernatorial race. Not to worry JR, as Sue Ellen later caresses the necklace he bought her, it appears there may still be embers of the old JR-Sue Ellen flame somewhere deep inside. At the annual Ewing barbecue, which may be the last on Southfork, Lucy Ewing and Ray Krebbs make another cameo appearance as comic relief. Groan. At least Lucy appears to be happy. Christopher and Rebecca take steps to protect their marriage. Christopher gives Elena a $20,000 check in payment for her help in getting his methane project going. A hurt Elena can’t believe it when Christopher coldly tells her he did it to avoid giving her any legal claim on his company. It’s obvious, however, that he did it to keep Elena — and temptation — at bay as Bobby suggested. Rebecca, meanwhile, feels cornered when John Ross arrives at Southfork ready to tell Chris about the email so she takes her husband aside for a private chat. Will Rebecca really confess to sending the email? Stay tuned, folks!